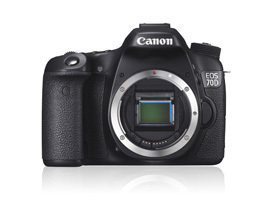 Canon EOS 70D review: how does the new dual pixel CMOS AF sensor perform? Besides being this year’s update to the firm’s range of mid range APS-C EOS DSLR model, Canon’s EOS 70D brings unexpected yet welcome technological advances in the form of a proprietary 20.2 M-Pix Dual Pixel CMOS AF sensor. Each pixel has twin photo diodes that can be read together for image capture or separately for fast focusing during movie capture. 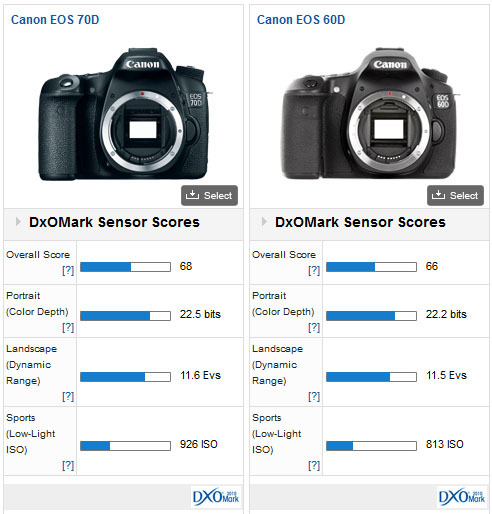 Sensor sensitivity doesn’t appear to be adversely affected with the EOS 70D offering ISO settings up to 12,800, expandable to 25,600. In stills mode and continuous shooting up to 7fps. The EOS 70D adopts a viewfinder based AF system with 19- cross-type subject detection points. Other notable features include a 7.7cm (3-inch) articulated touch screen with a very high (1.04-Million dot) resolution and remote shooting and image transfer with built-in WiFi. Apart from the new autofocus system employed during movie capture, the EOS 70D can record full HD movies in 30, 25 and 24fps and 720p in 60 and 50fps using inter or intra frame H.264 (MOV) format. The camera is available now at $1,199 body only, or for $1,349, complete with the 18-55mm STM f/3.5-5.6 video oriented starter lens. 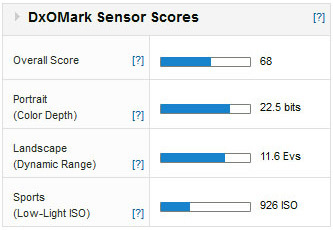 A DxOMark Sensor score of 68 is good for a Canon APS-C size sensor in fact it’s the best score the firm has achieved with this sensor size to date, but that’s only two points up on the best previous score of 66 points. 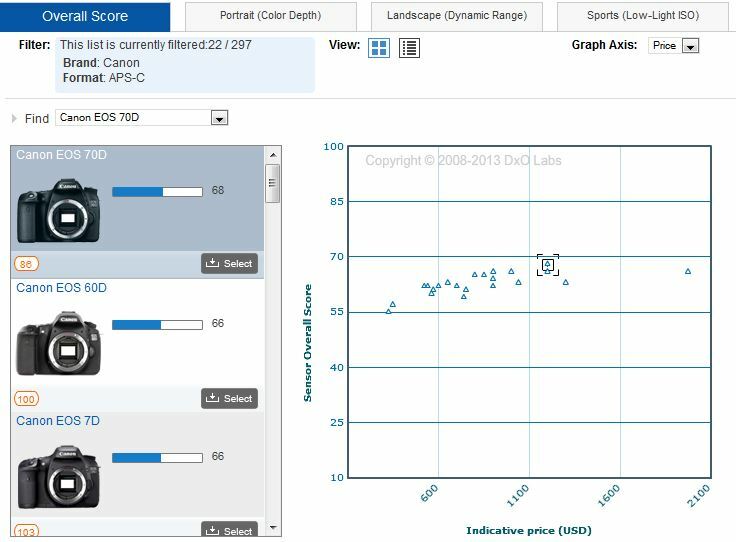 As a result, the scores for Color Depth, Dynamic Range and Low-Light ISO are all an improvement on earlier models but it’s an incremental increase on the EOS 60D. On the plus side, this sensor has the highest pixel density of any previous APS-C size sensor from the firm (which bodes well for fine detail rendering) while still offering the dual pixel construction with its unique AF capabilities required for video capture with the mirror locked up. Alongside the $799 (body only) Canon EOS 60D with its conventional 18-MPix APS-C CMOS sensor, the EOS 70D shows some very slight improvement in Color Depth but no increase in Dynamic range, which is somewhat discouraging. A very small improvement in Low-Light capabilities was measured but in real world terms this isn’t likely to be noticeable. When related to rivals, the new Canon’s scores look sub par. Compared with the $1,199 Nikon D7100 with its 24.1-MPix CMOS sensor the EOS 70D has -1.0 stop less Color Depth, -2.0 stops less in Dynamic Range and around -0.2 (1/5) stop less in Low-light ISO scores. 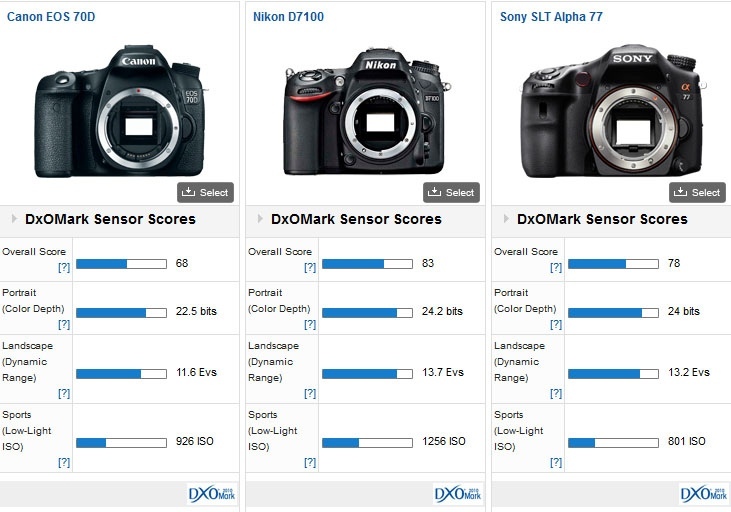 Pitched against the 2011, $1,098 Sony SLT Alpha 77 (again using a 24-MPix CMOS) the Canon is still behind except on Low-Light ISO where there’s an improvement. In real world terms, however, it would be very hard to see any difference. While the new dual pixel video AF system sounds promising, for stills photography the sensor in the Canon EOS 70D will perform very similarly to that the earlier EOS 60D (which was introduced in late 2010). That is slightly disappointing but there has been an improvement in pixel count (and likely resolution) and that’s not to say the other features and outright capability of the camera isn’t compelling, as it is.